"Mega - Masked - Magnolia"
Oh my this was a labour of love, not to mention second attempt! I lost count how many masks I had to make to complete this project, and yep you guessed it I'd stamped over half of the original one when I stamped before I'd masked!!!!! After the first disaster, I really had to concentrate so I didn't make any more bloopers - I daren't work out the hours I spent on this little beauty, but I was pretty pleased with the end result - what do you guys think? Jane, your work always blows me away, but this takes the cake! I LOVE IT!! Wow Girl! Your coloring ROCKS!!!!!! Fantabulous!! Oh my! This is FABULOUS! You should frame this. I would buy this and hang it up! I agree with Susan, this needs a nice frame and hung up! I love color but I don't have the patience to color by hand. I really admire your talent. Oh Jane! Wow!!! This has to be framed. Gorgeous. SHUT THE FRONT DOOR!!!!! You gotta be kidding. Floored!!!!! Wow! Jane your scene is beautiful! Amazing coloring! Thanks guys, it was the biggest challenge I've undertaken since painting watercolour portraits! One lapse in concentration wiped out hours of stamping, so I sort of held my breath on the second attempt praying I could finish it without any more mistakes! Would I ever tackle anything this big again, yep, sure, but I might try a digi collage next time!!! Egad! This is beyond awesome!! I can imagine how long it took and I can't imagine myself spending that much time at it... the result is absolutely gorgeous and worth it in your case! Wow! Jane I have to know. What are you going to do with this creation? At the moment it's sitting on my shelf in the studio, but I may well get it framed!! Jane if your wondering why I've taken so long to comment it's because I'm STILL taking it all in. The layers and Layers and layers of stamping is AMAZING. Stunning creation, I can only imagine the work that's gone into this beauty! 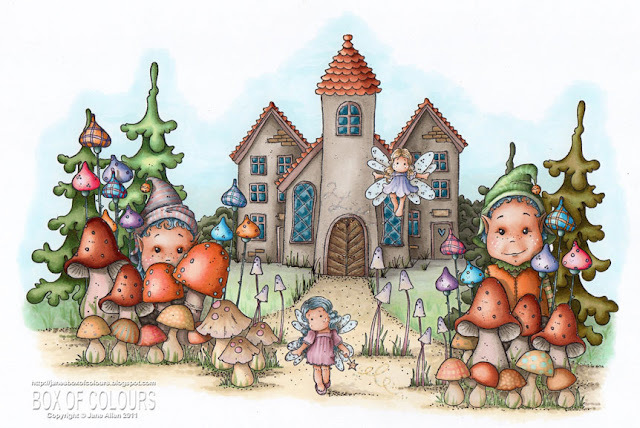 Your colouring is out of this world and you are one uber talented lady, not to mention having the patience of a saint! Wow, this is fabulous - beautiful beautiful coloring!